Happy Birthday, baby Jesus. Hope you like crap! Christmas is a wonderful time of the year. 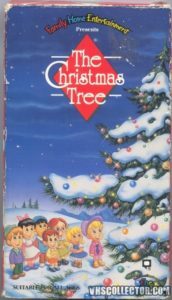 It’s a time to cash in on the need for cheap stocking stuffers and children’s entertainment by making AWFUL Christmas specials like this year’s main course: 1991’s The Christmas Tree. We’ll be having a few side dishes of holiday shorts before we dig into The Christmas Tree, so come and be merry. This one is a family-friendlier PG-13!